Ace Hi Plumbing, Heating and Air in Northern Colorado is your one-stop shop for water heater repair and replacement. Our plumbers and HVAC technicians serve Northern and Central Colorado, including Fort Collins, Loveland, Estes Park, and Longmont. We offer full-service heater repairs on all makes and models of tankless, gas and electric water heaters. We have been trusted in Northern Colorado and the surrounding areas for over 17 years. Our staff is highly trained to answer all your water heater repair and replacement questions. We are family owned and operated and offer same-day service and guarantee it will be fixed the right way at a fair price. Are you looking to replace your old hot water heater? Let the experts at Ace Hi Plumbing, Heating and Air assist you with picking the perfect unit for your family and your home. Tankless water heaters heat the water as you’re using it. They don’t waste energy keeping a large tank of hot water; they are more energy efficient than traditional water heaters and provide you with an almost unlimited supply of hot water. We offer only the highest quality of brands and fully guarantee any work that we install. 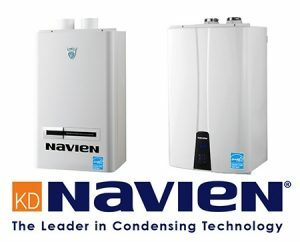 Specifically, we use Navien tankless water heaters and Bradford & White and Rheem for tank water heaters. Contact us today to learn more about tankless water heaters or any water heater repair and replacement that you might need. There are many companies today that produce good quality water heaters. In fact, there are so many good quality water heaters that you may find yourself in a situation where you do not know which water heater is best. For your sake, there are some guidelines that might help you choose water heaters that fit your needs. When you buy water heaters, you must take note of its fuel type. This is because the fuel type affects the size of the water heater, its price, and its operation cost. Also, the fuel type might affect its energy efficiency. Look at the energy efficiency rating of the water heaters you like before you buy them. Just because some water heaters are cheaper does not mean that they will cost you less over long periods of time. Buy a water heater that has a high energy efficiency that will save more in the long run. The size of your water heater is also important to take note. If you have a big family, say about 7 members or so, you probably need a bigger water heater. Remember that you need the water heater to be energy efficient. In order to maximize its efficiency, it needs to be in the proper size to serve your family’s needs. If you buy a water heater that might be just large for your family’s needs, it may cost you more over time rather than save you more. Talk to our certified plumbers in Northern Colorado for a recommendation on the size of a hot water heater replacement before you consider repairing the old one. Suppose you have found some water heaters that passed the qualifications of the previous tips. You will have to compare them all to make the best decision on which one you should buy. First, determine your budget for both the water heater unit as well as your expected monthly operating cost. Once you have your budget, check the price of the water heaters and their expected annual operating cost. If they are affordable enough, you probably should get it. If you have any further question, contact us at Ace Hi Plumbing, Heating and Air. Our plumbers will take good care of your water heater repair and replacement. We can also get you set up for a tankless water heater, if you choose that is best.